Team building is one of the foundations of organizational development that can be applied to a variety of groups such as sports teams, school classes, office staff, and military units. For an organization to run efficiently and meet its goals, it is important to foster a work environment that supports collaboration amongst colleagues. Unfortunately for most organizations, this does not occur naturally, and therefore you must make an effort to help build and sustain a supportive work environment. Teamwork must become part of your culture. An understanding of your teams wants and needs will help foster their growth into stronger assets for your organization. According to Jeff Fermin, an entrepreneur and a contributor to Huffington Post, 83% of employees feel that they don’t have an engaging employment brand. Here at Aviator we know that working together can generate team wins, reach goals, overcome obstacles, and create a constructive work environment where team cohesiveness comes naturally. Even for the people who aren’t into group programs, don’t stress. There is an art to this and we have it down. Our 30-foot indoor rock wall will mobilize your team to develop their coaching skills, goal-setting processes, and creative problem solving expertise with this intensive fun team challenge. Break the ice with classmates and share some laughs around two of our ice rinks. Understand the importance of structure and role clarification with indoor/outdoor soccer, basketball, or dodgeball. Our professional facilitators will be there every step to deliver an exciting program, engage your team, achieve your goals, and debrief. Aviator provides you with a list of exciting team building activities and games to choose from. Want to Know More About Aviator Team Building Activities? Working as a collaborative team member is not a skill that everyone is born with; however, it is a skill that can be learned, and here at Aviator we make learning FUN! 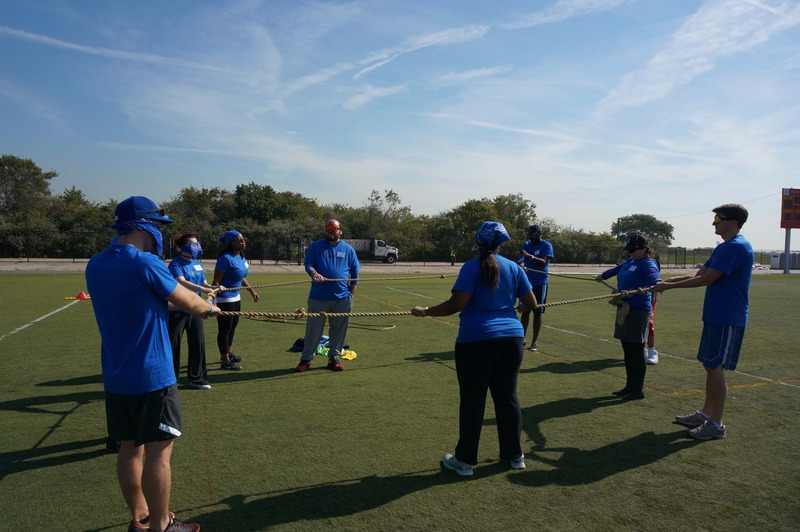 For more information or to book your team building activities at Aviator Sports and Events Center contact Lorrie Burger: Lorrie@aviatorsports.com or 718-758-7560.